Vampire Bats are SPOOKY!! And, this Vampire Bat is no exception. In this post I’m going to show you how to make a Vampire Bat out of a juice box. 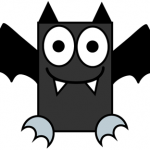 In just a few steps you can make this fun and festive juice box Vampire Bat.